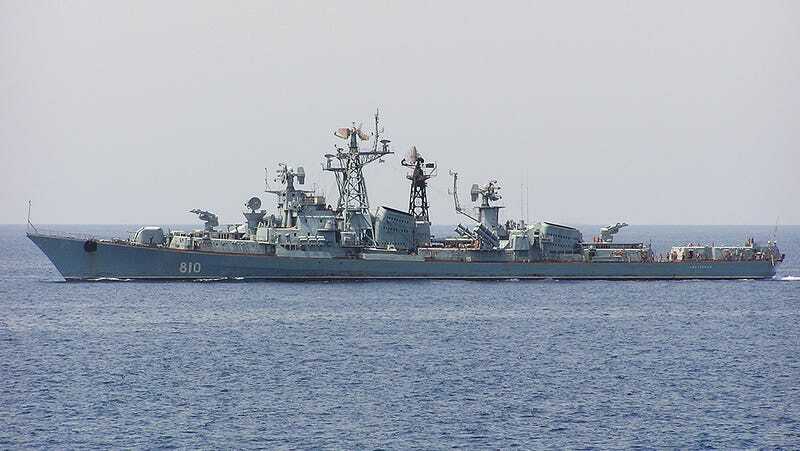 Russia fired shots at a Turkish fishing vessel in the Aegean Sea today, and the Kremlin claims the rounds were fired because the vessel was on a “collision course” with the Kashin class destroyer Smetlivy that was sailing through the area. The fishing vessel turned away at about 1,800 feet after the shots were fired, but continued to shadow the destroyer at about that distance. Russia claims it tried to make contact with the vessel via radio before and after the incident, to no avail. The Smetlivy was operating in the northern Aegean, about 12 nautical miles from the Greek island of Lemnos. This incident comes as tensions with Turkey continue to mount, especially in regards to both countries naval sphere of influence. Turkey has supposedly been slowing Russian ship movements through the Bosphorus Strait, while Russia has had its sailors don shoulder-fired surface-to-air missiles as one of its ships made its way past Istanbul. Yet today’s incident would be the first instance in which actual rounds were fired at or from a naval asset of either country. This whole series of escalations seems eerily like those that led up to the shooting-down of a Russian attack jet by Turkish F-16s late last November. And now, tensions are heightened further by the crescendo on rhetoric that has come from both sides following the air-to-air engagement. The fact that Turkey has put troops and armor into Iraq without permission from the Iraqi central government, and is unwilling to pull them out under Iraqi demands, has given yet another opportunity for Russia to lambaste Turkey on the world stage. Additionally, Putin has not stepped back from accusations that officials at the highest levels of the Turkish government are involved with the black market oil trade that largely funds ISIS. Hopefully the powers that be will move to cool things down a bit so that the next rung in the escalation ladder is not reached, as the alternative could vastly change the fabric of stability in an already unstable region.